Proc. SPIE Photonics West, Vol. 4675, pp. 1—13. Symposium on Electronic Imaging, San Jose, CA. Hiding, LNCS 1768, pp. 61-66, Springer-Verlag Heidelberg. Steganalysis, IEEE Transactions on Information Forensics and Security, Vol. 3, Issue 4, pp. 651- 661. Altun, O., Sharma, G., Celik, M., Sterling, M., Titlebaum, E. and Bocko, M. (2005). '05), Vol. 2, pp. 21- 24. Audio Quality Metrics, Proc. SPIE, Security and Watermarking of Multimedia Contents V, Vol. 5020, pp. 55-66. Systems, IEEE Transactions on Speech and Audio Processing, Vol. 13, No. 6, pp. 1098-1109. Nonlinear Methods”, IEEE Transactions on Speech and Audio Processing, Vol. 7, No. 1, pp. 1- 17. Nonlinearity in Time Series: The Method of Surrogate Data, Physica D 58. pp. 77 - 94.
in brain electrical activity, Physical Review E, Vol. 67, No. 046204.
a time series, Phys. Rev. E, Vol:55. pp. 5443-5447.
the Nature of Time Series, IEEE Transactions On Bıomedical Engineering, Vol. 51, No. 5. Advances in Cryptology, pp. 51-67. Systems Journal, vol. 35, no: 3&4, pp. 313-336. Modulation, Proc. SPIE Electronic Imaging, Santa Clara, CA, pp. 191-202.
watermarking for multimedia, IEEE Tr. Image Proc., vol 6, pp. 1673 – 1687.
www.steganos.com,. Access Date: 23.Nov.2011, Subject: Steganos. www.petitcolas.net/fabien/ steganography/mp3stego,Access Date: 12.Sep.2011, Subject: Mp3stego. http://steghide.sourceforge.net, Access Date: 13.Sep.2011, Subject: S. Hetzl. Kennel, M. B. and Abarbanel, H. D. I. (2002). False neighbors and false strands: A reliable minimum embedding dimension algorithm”, Physical Review E, Vol. 66, 026209. Hilborn, R. (2000). Chaos and Nonlinear Dynamics, Oxford University Press, 2. ed. Hegger, R., Kantz, H. and Schreiber, T. (1999). Practical Implementation of Nonlinear Time Series Methods: The TISEAN Package, Chaos, Vol. 9, pp. 413-435. Pudil, P., Novovicova, J. and Kittler, J. (1994). Floating Search Methods in Feature Selection, Pattern Recognition Lett. Vol 15, pp. 1119-1125.
http://eewww.eng.ohio-state.edu/~maj/osu_svm/, Access Date: 24.Sep.2011, Subject: OSU- SVM Matlab Toolbox. Özer, H., Sankur, B., Memon, N. and Avcıbaş, İ. (2006). Detection of Audio Covert Channels Using Statistical Footprints of Hidden Messages, Digital Signal Processing, Vol.16, pp. 389-401. Makale 19.11.2013 tarihinde alınmış, 07.12.2013 tarihinde düzeltilmiş, 09.12.2013 tarihinde kabul edilmiştir. ISNAD YÜRÜKLÜ, Emrah , KOÇAL, Osman Hilmi , DİLAVEROĞLU, Erdoğan . "A New Approach For Speech Audio Steganalysis Using Delay Vector Variance Method". 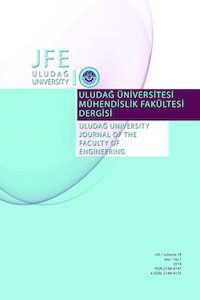 Uludağ University Journal of The Faculty of Engineering 19 / 1 (April 2014): 27-36.